Hardy Blue Plumbago looking good in a morning sun / afternoon shade setting. This is how it looked on June 15th. I'm a big fan of groundcovers - at least in theory. So why do groundcovers get a bad rap sometimes? Groundcovers (as the name implies) need to cover ground, but some of them are too good at their job. They cover so much ground that they swamp everything in their way, smothering perennials, invading lawns (and even worse, sometimes invading natural areas), sometimes even tearing down trees (I'm looking at you English Ivy). What are some of the other groundcovers that give the category a bad rap? Oh, plants like Yellow Archangel, Vinca, Bishop's Weed, etc. That said, a few bad apples shouldn't give a whole category a bad rap. So I've been trialing a number of groundcovers at Garden of Aaron to see which ones are tough enough to survive without much coddling yet not so rampant that they take over the property and kick me to the curb. My preference (as with other plant categories) is to use native Southeastern U.S. plants - ideally Tennessee natives - but I've also tried some exotics. 2. Beautiful self-cleaning blue flowers from late summer to autumn (no need to deadhead). Attractive semi-glossy foliage. 4. Not too aggressive or fast-spreading. Seems easy to control. Not listed as invasive as far as I know. 5. Does not seem troubled by any pests or diseases. Some of the Dave's Garden reviewers report the plant surviving for decades in their yards with little human intervention. That's the kind of garden plant I respect and admire! 4. Spreads slowly. This is an attribute from a control standpoint (you don't have to worry about it taking over the whole flower bed when your back is turned), but means you'll need a lot of plants and/or a lot of time if you hope to cover a large amount of ground. I have not tried dividing the plant yet to accelerate its spread. This year, the plants in the front of the house (in partial sun and looser soil) seem to have expanded their coverage, but the plant in full sun and more compacted soil looks pretty much the same size as it did last year. 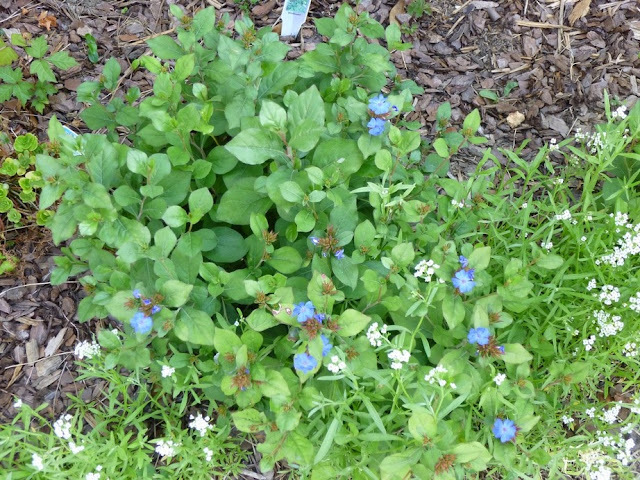 UPDATE 12/13/15 - I would no longer recommend hardy blue plumbago. 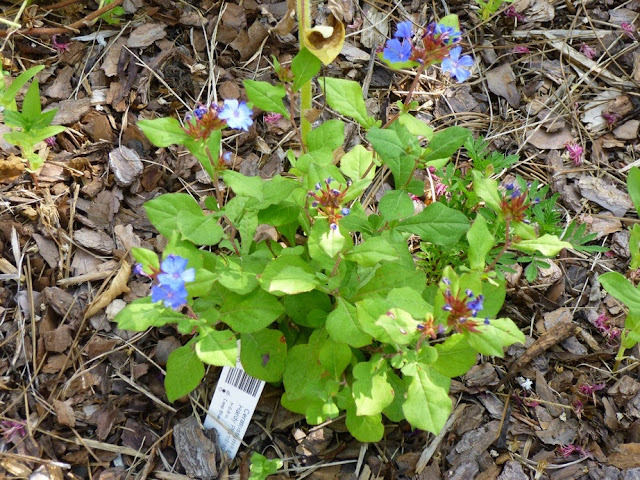 In fact, I've done my best to rip my patch Ceratostigma plumbaginoides out of the front foundation bed this autumn. From an aesthetic standpoint, I did not care for the foliage, the growth habit or the fact that its deciduous nature meant that it did a poor job as a groundcover for 5-6 months of the year. The deciduous aspect would be less of a concern in a climate with dependable snow cover, but here in Tennessee, where snow cover is usually bare or non-existent, a deciduous groundcover equals bare ground. And then there was the aggressive/pushy/invasive nature of the plant. It's not a rapid spreader - at least in my heavy clay-based soil. I didn't find it traveling 10 feet underground in a single season. But slowly, inexorably, it was pushing outward and over-running other small perennials in its path. When I tried to pull up pieces of the groundcover, I found an extensive and deep network of criss-crossing roots underground. Those roots tended to break easily if pulled, making it quite a chore to uproot a patch of hardy blue plumbago. As I discuss in my upcoming roundup of recommended groundcovers, I believe that the ability to uproot and easily remove pieces of a groundcover - or an entire patch - plays a major role in determing the garden worthiness of a plant --- especially a non-native / exotic plant. So yep, hardy blue plumbago joins blue star creeper and creeping raspberry on the Not Recommended list of groundcovers. 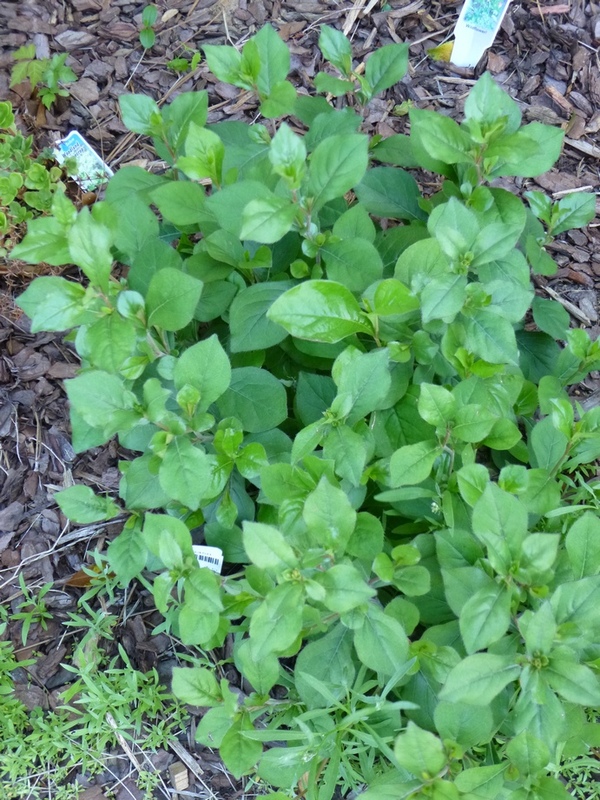 Which groundcovers do I recommend as of December 2015? So far, some of my favorite herbaceous groundcovers include the cranesbill geraniums (especially Geranium sanguineum and G. x cantabrigiense), lamb's ear, wall germander, rose petty, Geneva bugleweed, Coreopsis verticillata and Epimedium x perralchicum 'Frohnleiten'. UPDATE APRIL 2017 - I no longer recommend the bloody cranesbill geranium (G. sanguineum) or lamb's ear or wall germander or any of the bugleweeds (Ajuga species). All of those are exotic plants. The bloody cranesbill and the bugleweeds especially are invasive, aggressive and hard to remove. Lamb's ear is easy to remove, but not great aesthetically in the garden. It looks awful in winter and it's a pain in the posterior to remove the smelly, decomposing old growth in spring. Lamb's ear cultivars like Helene von Stein rarely flower. The species does have long-lasting fuzzy spikes adorned with purple flowers that attract pollinators (+1 for the lamb's ear), but unfortunately the pollinated flowers lead to quite a bit of self-sowing in the immediate vicinity. Basically, I would discourage anyone from planting the bloody cranesbill or the Ajugas outside of their native habitats. Even there, I'd be leery of them unless you like super aggressive plants. The lamb's ear and the wall germander are a bit more manageable and have certain appealing characteristics. They weren't right for me, but if you have a small garden or don't mind a groundcover that demands a certain amount of work, they could work for you. Personally, I prefer Geranium x cantabrigiense 'Biokovo', rose petty (Erigeron pulchellus), as well as wild strawberry (Fragaria virginiana), golden groundsel (Packera obovata) and 'Blue Spruce' sedum. No lambs ears? Baaa humbug!��They've been one of my favorites for years. Nearly indestructible once established, they go well with any of the flowers in my garden and soften hard edges in the landscape. Self sowing little baby lambs is actually a plus. Every now and then a neighbor will take some home to start in their garden. A couple of times a year they need a good cleanup of brown leaves, but they have never smelled. I agree with you that lambs ears are 'nearly indestructible once established'. As I say, I can see how some people would like lamb's ears in their gardens. I did appreciate the flowers. I wouldn't have minded a little self-sowing, but I'd say it volunteered *vigorously* -- and that was when I just let a few plants go to seed. If I let those plants grow up, flower and go to seed, pretty soon I think I'd have a lamb's ear invasion on my hands! As you say, lamb's ear probably looks good if you're willing to put in the time and effort to clean it up a few times a year. My garden is pretty big and I have ambitions to grow an even larger garden, so I'm always on the lookout for very low-maintenance plants, and lamb's ear does not fit that bill. But I'm glad it works well in your garden! Just goes to show there are no one-size-fits-all solutions in gardening! I found your post on hardy Plumbago very helpful, and it answered a lot of questions I had about it. So nice to read about someone's candid personal experience over time. I have a small start of it, and now I have a much better idea of what to expect and where to plant it. Thanks for sharing your gardening experience! Very good review on the Plumbago. You talked me out of it for a good groundcover. Thanks! Thank you! Glad to be of service! - Erigeron pulchellus, Robin's plantain - good in partial to full shade. Have not tried it in full sun. - Packera obovata or Packera aurea, Golden groundsel - One patch in partial shade (northern house foundation) has spread much more than the others, but I have another small patch in full sun that seems to be thriving this year. I suspect Packera can grow well in sun or shade. - Coreopsis verticillata, threadleaf coreopsis. I bit unpredictable, but I have a couple of patches thriving right now in full sun, difficult settings - one on a steep slope, the other with lots of reflected heat from hardscapes. - Conoclinium coelestinum, blue mistflower. This one is a bit rambunctious. And it makes a rather tall groundcover. But it's native and has amazing light blue flowers in autumn that attracts loads of bees, butterflies and other pollinators.